Most cells periodically divide into two daughter cells, so a cell has a life cycle extending from one division to the next. 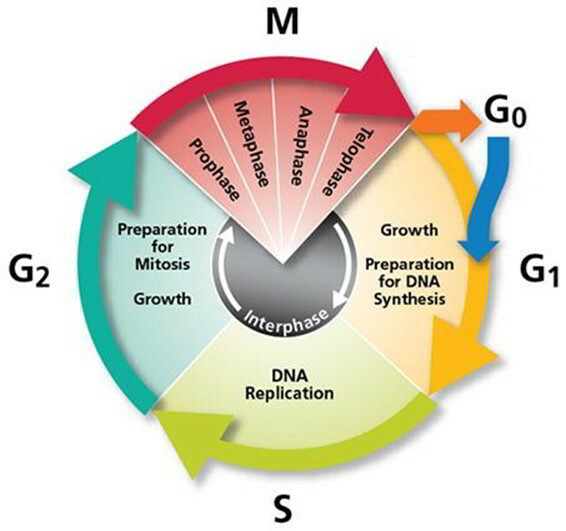 This cell cycle is divided into four main phases: G1, S, G2, and M.
G1 is the first gap phase, an interval between cell division and DNA replication. During this time, a cell synthesizes proteins, grows, and carries out its preordained tasks for the body. Cells in G1 also accumulate the materials needed to replicate their DNA in the next phase. In cultured cells called fibroblasts, which divide every 18 to 24 hours, G1 lasts 8 to 10 hours. S is the synthesis phase, in which a cell makes a duplicate copy of its centrioles and all of its nuclear DNA. The two identical sets of DNA molecules are then available to be divided up between daughter cells at the next cell division. This phase takes 6 to 8 hours in cultured fibroblasts. G2, the second gap phase, is a relatively brief interval (4-6 hours) between DNA replication and cell division. In G2, a cell finishes replicating its centrioles and synthesizes enzymes that control cell division. It also checks the fidelity of DNA replication and usually repairs any errors that are detected. M is the mitotic phase, in which a cell replicates its nucleus and then pinches in two to form two new daughter cells. In cultured fibroblasts, the M phase takes 1 to 2 hours. The details of this phase are considered in the next section. Phases G1, S, and G2 are collectively called interphase—the time between M phases. The length of the cell cycle varies greatly from one cell type to another. Stomach and skin cells divide rapidly, bone and cartilage cells slowly, and skeletal muscle cells and nerve cells not at all. Some cells leave the cell cycle for a “rest” and cease to divide for days, years, or the rest of one’s life. Such cells are said to be in the G0 (G-zero) phase. The balance between cells that are actively cycling and those standing by in G0 is an important factor in determining the number of cells in the body. An inability to stop cycling and enter G0 is characteristic of cancer cells. All reproduction begins at the cellular level. The process by which a cell divides into two and duplicates its genetic material is called the cell cycle. The cell cycle is divided into three main stages: interphase (the stage in which great activity is occurring but this activity is not visible; thus, this stage used to be called a “resting stage”), mitosis, and cytokinesis. Two of these three stages have substages. We shall discuss all stages in detail. The time to complete a cell cycle will vary greatly among different organisms. Cells in a developing embryo will complete the cell cycle in less than 20 minutes. 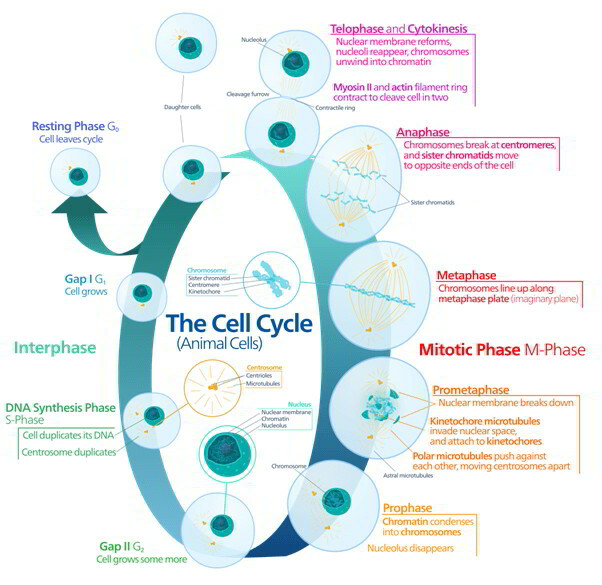 A dividing mammalian cell will complete the cycle in approximately 24 hours. Other cells in our bodies rarely duplicate and undergo the cell cycle, such as nerve cells and muscle cells. Human liver cells will divide only if damaged. They usually have cell cycles lasting a full year.